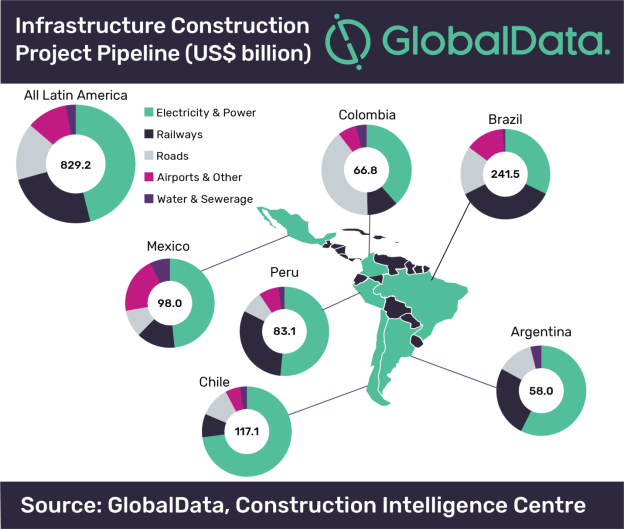 The total value of infrastructure spending in Latin America will reach US$142.5bn in 2019 and US$175.8bn in 2020, based on the current pipeline of 1,711 large-scale projects with a combined value of US$829.2bn, according to GlobalData, a leading data and analytics company. GlobalData’s latest report: ‘Infrastructure Insight: Latin America’ reveals that a wide range of infrastructure investment opportunities are being created for investors throughout the region by a combination of favorable demographic trends and the implementation of a number of legislative reforms. Dariana Tani, Economist at GlobalData, comments: “Brazil, Chile, Mexico and Peru are set to drive overall investment between 2018 and 2022 with an expected annual average spend of US$36.3bn, US$17bn, US$13bn and US$12.4bn respectively. Projects will include the US$2.7bn SP-99 Tamoios Highway Duplication in São Paulo; the US$6.5bn Lima Metro Line 2 in Peru; and Chile’s US$3bn Alto Maipo Hydroelectric Complex 531MW. However, deteriorating external conditions such as global trade tensions, higher US interest rates and slowing global growth could negatively impact the outlook. Further increases in US interest rates, for instance, could pull more capital away from the region, and push up the cost of borrowing to build infrastructure. Meanwhile, political uncertainty over next years elections in the region and a larger-than-expected recession in Argentina, which could spread to neighboring countries with strong trade exposures, are other important risks of note. With a total of 421 projects valued at US$241.5bn, Brazil has the highest number of infrastructure projects in the pipeline. This is followed by Chile with 309 projects (US$117.1bn); Peru with 230 projects (US$83.1bn) and Mexico with 209 projects (US$98bn). Colombia and Argentina also have a large number of projects, with 114 (US$66.8bn) and 92 (US$58bn) respectively. Among the smaller markets, Bolivia and Panama have pipeline values of US$43bn and US$32.7bn, respectively. The electricity and power sector has the highest value of projects in the pipeline, with US$381.9bn, while rail projects valued at US$204.3bn account for the second largest sector. Roads recorded the third-largest share, with US$129.3bn; followed by airport and other projects with US$91.7bn and water and sewerage projects with US$22.1bn. Furthermore, of the total infrastructure construction pipeline, 56% of projects by value are in the pre-planning and planning stages, while 44% are in the pre-execution and execution stages. Moreover, the public sector is expected to directly finance 40% of the total value of projects while a mix of public and private sources will finance 33% of the total value. The remaining 28% will be financed by the private sector, the majority of which are electricity and power projects.